Researchers from the Popa Department of Obstetrics and Gynecology recently published a study in the journal Acta Microbiologica Et Immunologica Hungarica claiming infertility could be caused by or made worse by various bacterial agents. Researchers suggest infertile women be tested for multiple bacterial agents, especially Chlamydia trachomatis, Ureaplasma urealyticum and Mycoplasma hominis. Blood and cervical samples were collected from 45 pregnant and 176 infertile women. The samples were tested for various sexually passed bacteria, including chlamydia and gonorrhea. Chlamydia antibodies were higher in blood samples from the infertile group, but antigens for chlamydia and gonorrhea were similar among both groups. Co-infection posed the most significant difference between the infertile and pregnant group. 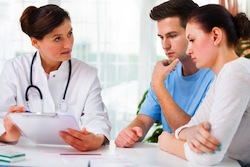 In more than 25% of infertile women, a co-infection of mycoplasma and chlamydia was observed. Researchers believe all women should be tested for a variety of bacterial agents in the reproductive years. If infertility is an issue, bacterial agents (especially co-infections) could play an important part. Source: Miron ND, Socolov D, Mareş M, Anton G, Nastasa V, Moraru RF, Virág K, Anghelache-Lupaşcu I, Deák J. Bacteriological agents which play a role in the development of infertility. Acta Microbiol Immunol Hung. 2013 Mar;60(1):41-53. doi: 10.1556/AMicr.60.2013.1.5.